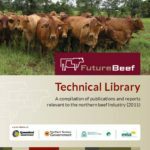 The FutureBeef Technical Library was developed and funded by Meat & Livestock Australia Limited, DAF Queensland, Northern Territory Department of Resources and the Department of Agriculture and Food Western Australia (FutureBeef partners). It is an indexed DVD library of northern Australian electronic, technical and information resources for beef producers, researchers and extension officers. The DVD contains final reports, publications, producer profiles, newsletters, facts sheets, webinars and short videos produced between 1992 and 2011. You can order your free FutureBeef DVD from Meat & Livestock Australia , by phoning 1800 023 100 or emailing info@mla.com.au.